I am performing again soon! 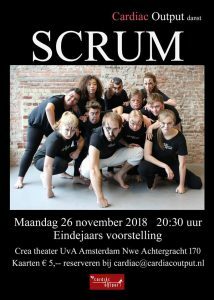 On the 26th of november you can find me in Crea Theatre for the performance SCRUM from Cardiac Output. I had the honour to choreograph and dance in this beautiful piece about Unity, Power and Creativity. Are you interested in the performance? Visit the website of Cardiac Output and get your tickets there!